I look at this nearly every day. I arrived at The Soap Factory’s $99 Sale late in 2011. Most of the work had already been claimed, but it didn’t matter to me. What I had eyes for, only, was Landscape Simulation : Fargo / Former PetSmart, Westgate Shoping Center, Macon, GA, 2011. At least that’s what is written on the back of the drawing. Of course, I didn’t know that at the time. I wouldn’t say that it “spoke to me,” but there was something deeply satisfying and nourishing looking at it. I feel like I squint whenever I look at the drawing. There’s something indistinct about it, but it’s also like scanning the horizon in a Western. Like you’re wearing that battered, square leather cowboy hat that Clint Eastwood wears in The Good The Bad and the Ugly, shading his eyes as he holds binoculars up to them like a submarine captain, elbows akimbo. Maybe I’m misremembering the binoculars. Does he even use binoculars or just wear that poncho and chomp on a cheroot? And where did the submarine come from? But it’s like that. I scan this drawing nearly every day, but I’m a lake person, not a plains person. What do I know? What is the attraction? How could something so desolate be “nourishing?” Especially with no water, no weather to eye. According to its title, the structure is a PetSmart at a Westgate Shopping Center in Macon, GA. Isn’t Eleanor Savage from Macon? When I had my second 50th birthday party, it was about 95 degrees and sweltering. Everyone was sweating like, well, like a pig. I’ve gone to the State Fair for tons of years, but I don’t actually know how or even if pigs sweat. I’ll have to ask the 4H girls about that next year. I still remember that Eleanor said it was just getting comfortable. Like back home. That’s about the extent of my knowledge of Macon. In 2010, I commissioned Chris Baker’s offscript for Santana Row shopping center in San Jose as part of the 01SJ Biennial. I remember it was across from a Westgate shopping center. We would have done it there, if they had sponsored us. We asked them first. I also curated Jennifer and Kevin McCoy’s Big Box (2007) for FeedForward at LABoral. Big Box is all about the “former” part. Nature takes over. Like New York City in I Am Legend. I attended a great conversation by artist Pamela Valfer and critic Christina Schmid tonight. It was thoughtful and open, and even though there was a lot of talk about Baudrillard, it was everything a public conversation should be but often is not. Thank you! Christina and Pamela. Nevertheless, by the end, I still hadn’t figured out exactly why me and the PetSmart in Fargo had hit it off so well. When I got home, I looked at Valfer’s website, and it turns out she had “renamed” the work on my wall: Landscape Simulation: Fargo (movie)/Vacant Pet Smart, Macon, GA. Not only had the Pet Smart (PetSmart?) changed from “former” to “vacant” but turns out the landscape is from the movie Fargo. This was necessary, the copying from movies part, Valfer averred during the conversation, because until a recent residency in rural Ireland, she had never really been in nature. While I cannot claim the same, it is impossible to deny that it is nearly impossible to look at nature, especially representations of nature, without a kind of virtual overlay and infinite reflection of representation upon representation. I suppose you could say, a la Baudrillard, welcome to the hyperreal, but Christina said something else that was interesting. She mentioned that in some study, people who looked at representations of nature did not have the same visceral, emotional reaction as people who looked at nature. I’m paraphrasing her paraphrase here, but the point she wanted to make is that the body knows. In some sense you cannot lie to the body and there is a difference between representation and the real. 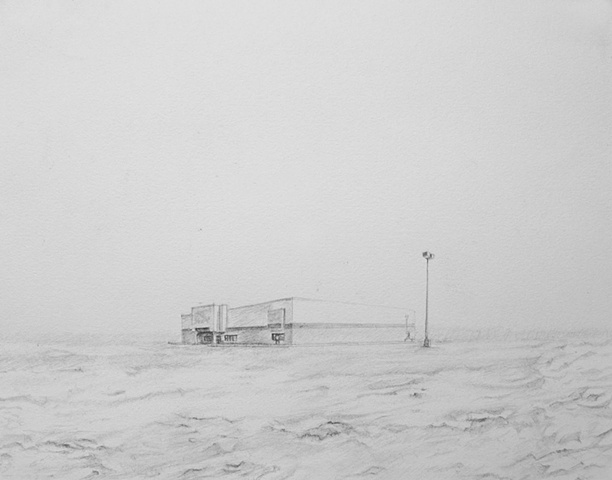 Pamela Valfer, Landscape Simulation: Fargo (movie)/Vacant Pet Smart, Macon, GA 2011 Graphite on paper 8" x 10"
While I do believe this in my bones – nature is different than its representation – the nourishment of Valfer’s bleak Fargo landscape with its vacant Pet Smart may just be its embedded, rich, complex, seductive, vital history of unnatural associations.